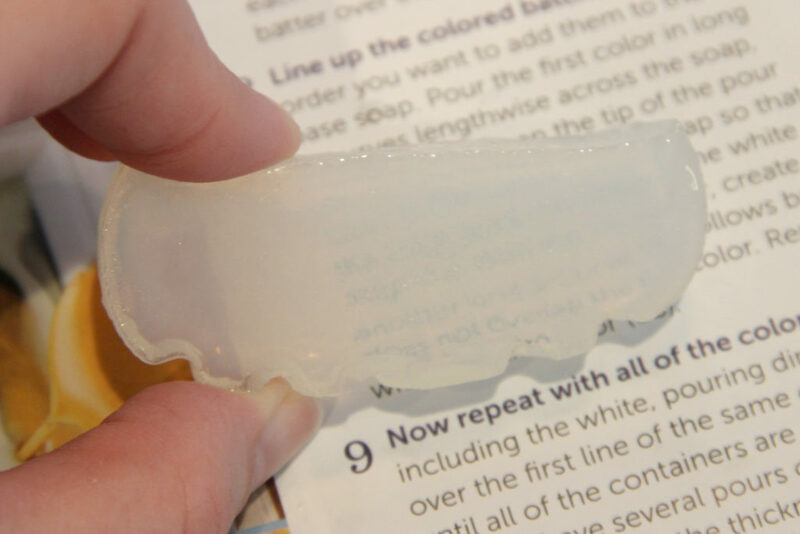 Okay, so if you’ve been in the soap making groups on Facebook lately, you’ve seen all of the transparent soaps that makers have been posting! Quite impressive! 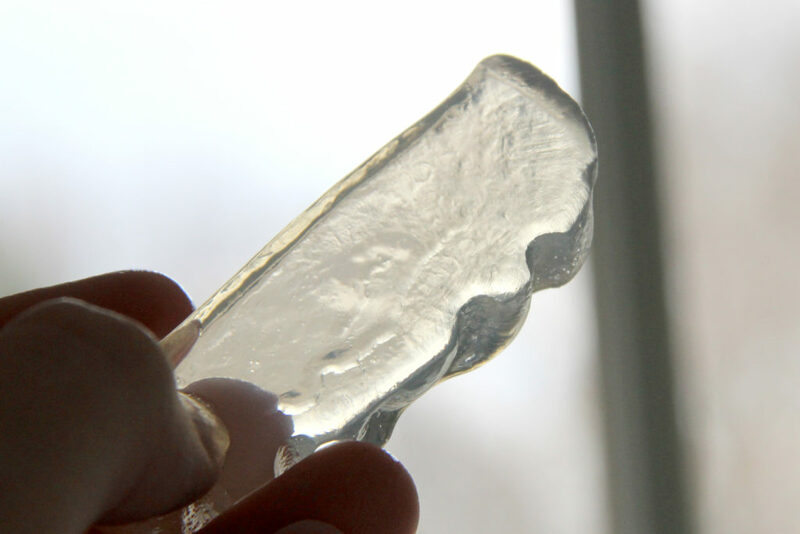 I’ve made transparent soap before, but nothing as clear as what we’ve been seeing lately. So, I got experimenting! 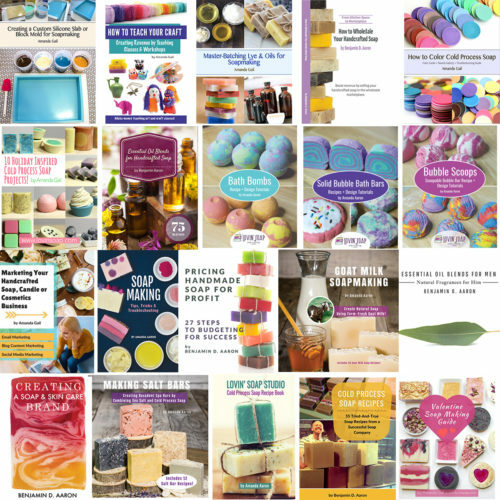 I was inspired by a post in our soapmaking group, Saponification Nation, by Harriet Pretzsch. 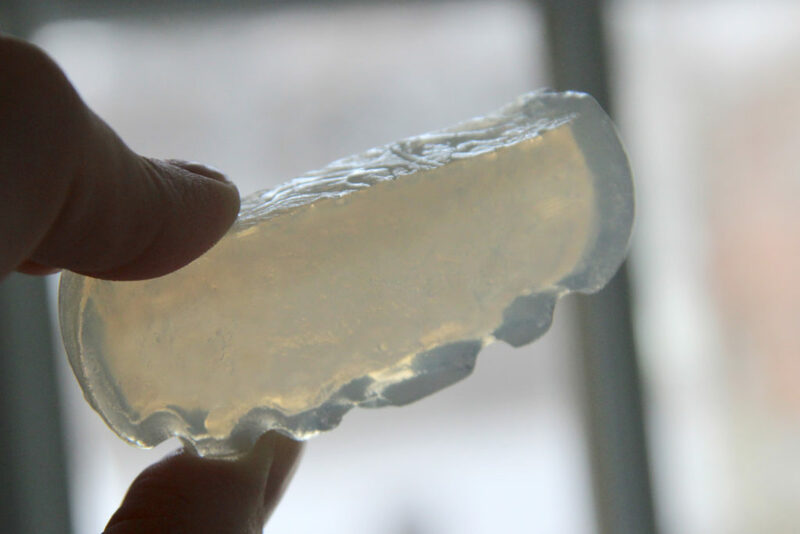 She generously shared her procedure for making a cold process transparent soap. You can find it on her blog here. You’ll have to translate it or join our FB group and search her name…you’ll find it translated. WARNING! This is an advanced tutorial. 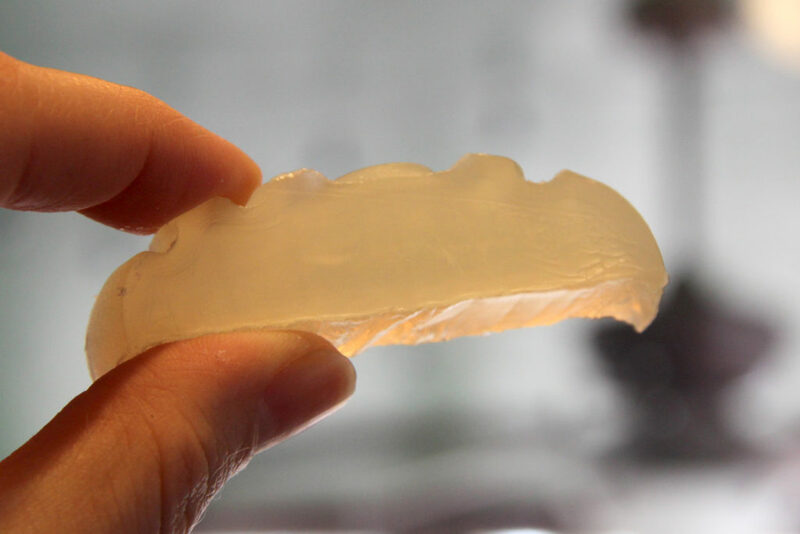 You should have some batches of cold process or hot process soap under your belt. 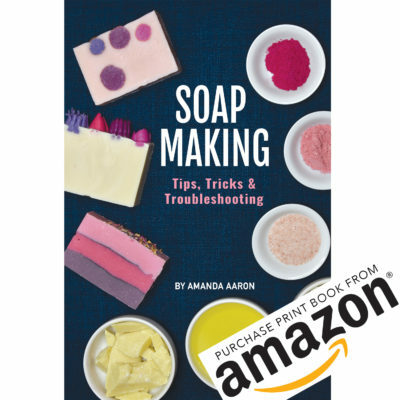 If you are new to soapmaking, check out our basic series on YouTube. 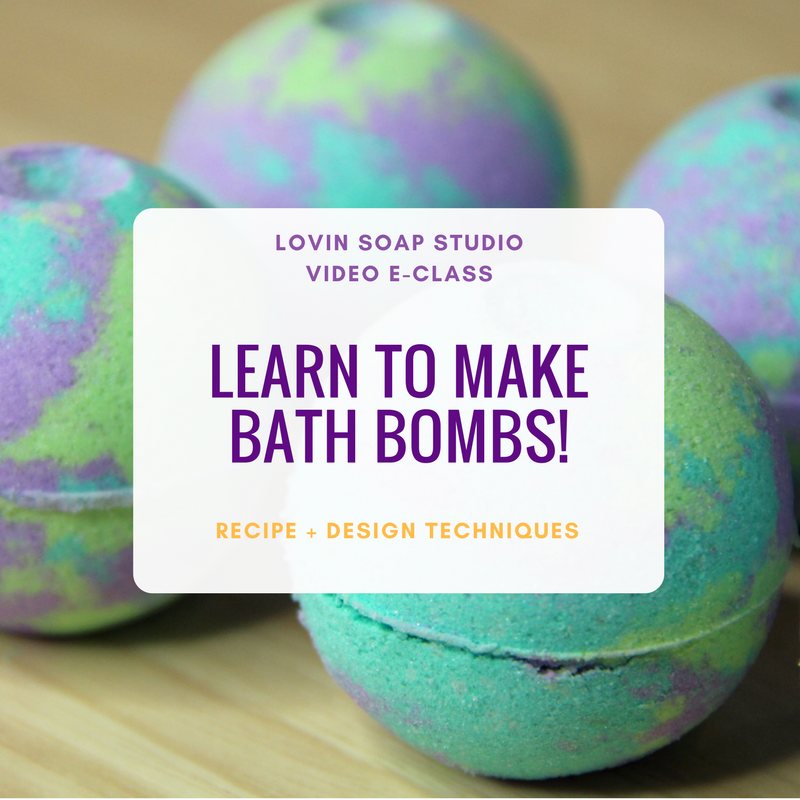 Wear safety gear when working with sodium hydroxide and make this soap in a well-ventilated area, especially when working with the lye solution and alcohol. 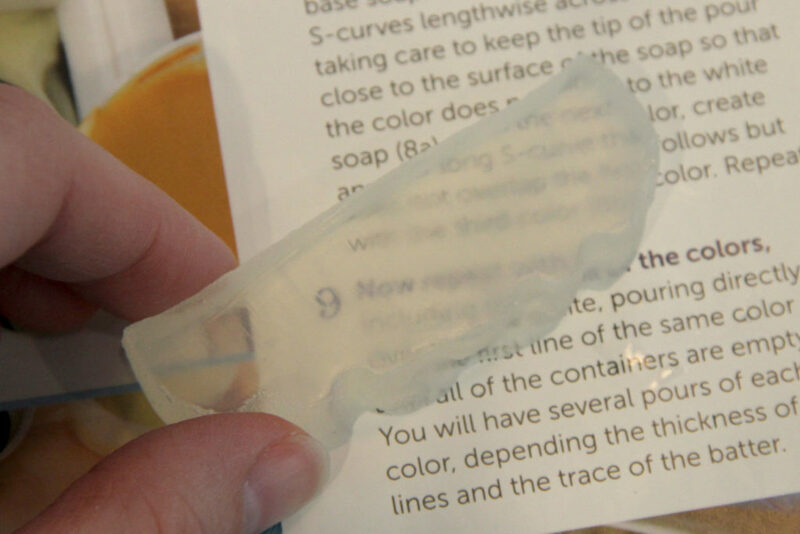 Transparent soap is all about the oils that you select and your solvents. Oils – You want to choose oils that are high in stearic acid and that have a low amount of unsaponifiables that can cloud your clear soap. You want to choose oils that are not yellow or green tinted…Harriet uses tallow, coconut, castor and rice bran. Because you do add lots of solvents (some with water), you want to use a high amount of hard oils to create a hard bar. I would shoot for 60%+ of tallow, lard, stearic acid or palm oil. I tried a few different blends. The more solvents I used, the more stearic acid/coconut oil I used. 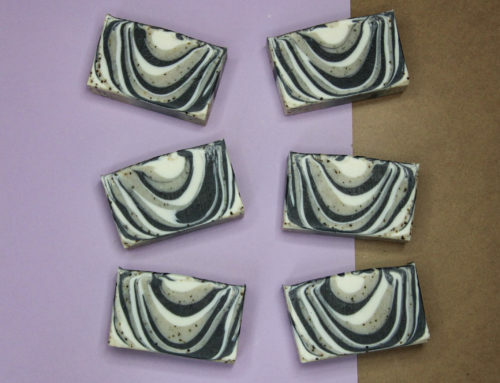 Superfat – Because superfat (unsaponified oils) can cloud transparent soap, go with a 0% superfat. 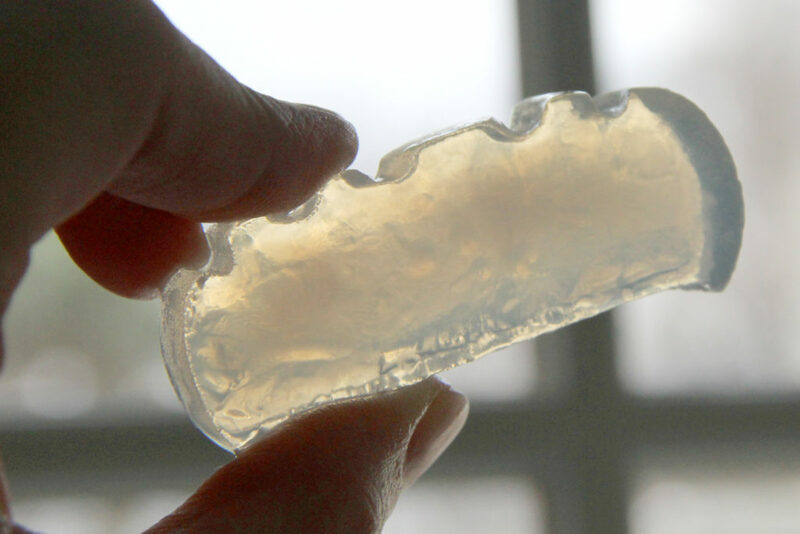 We do add glycerin, and that acts as a superfat in your soap. Solvents are what make the magic happen. 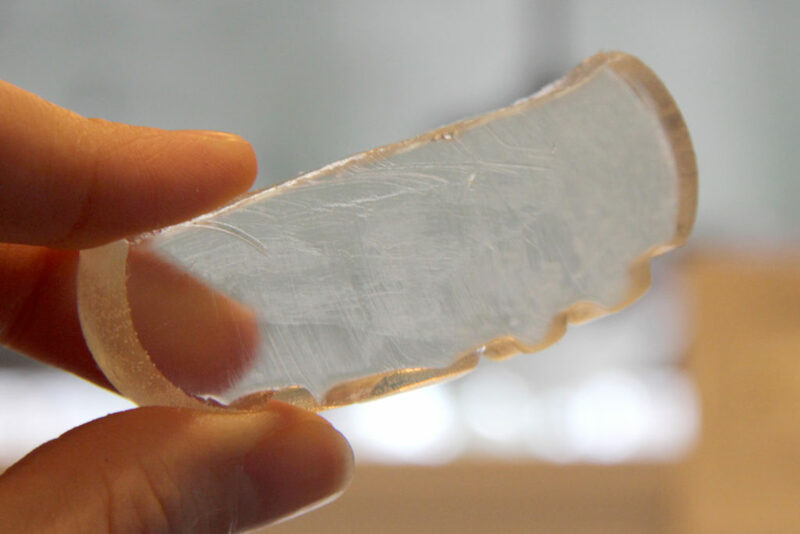 They dissolve the soap crystals that normally form when combining sodium hydroxide with fatty acids (base oils). Solvents include alcohol, liquid glycerin and sugar. You can use one, or for best results, try a combination. Alcohol – You can use either isopropyl or ethyl (ethanol) alcohol. 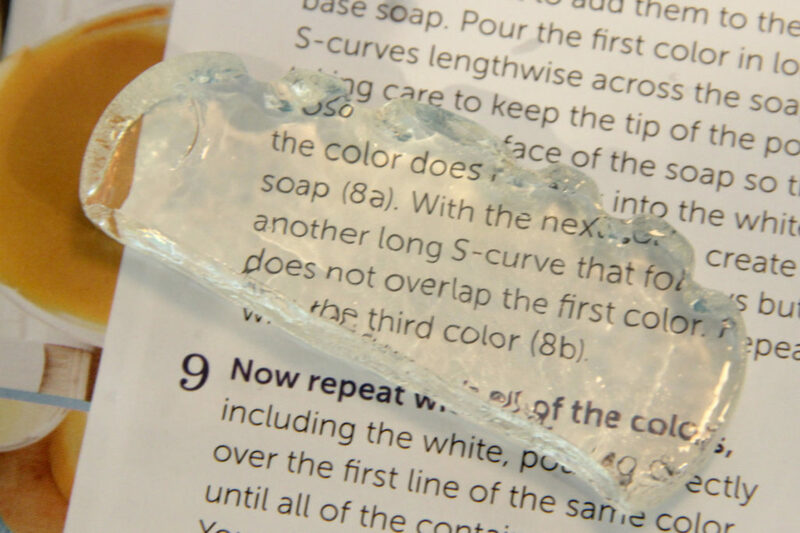 Ethanol seems to create a more clear soap. Each type of alcohol comes in different strengths. 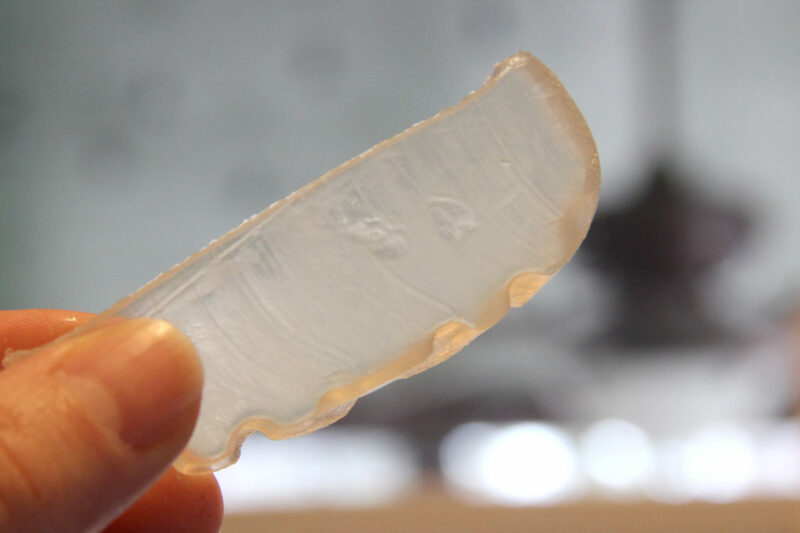 You want to find the purest/highest strength that you can so that you’ll end up with less water in your soap. 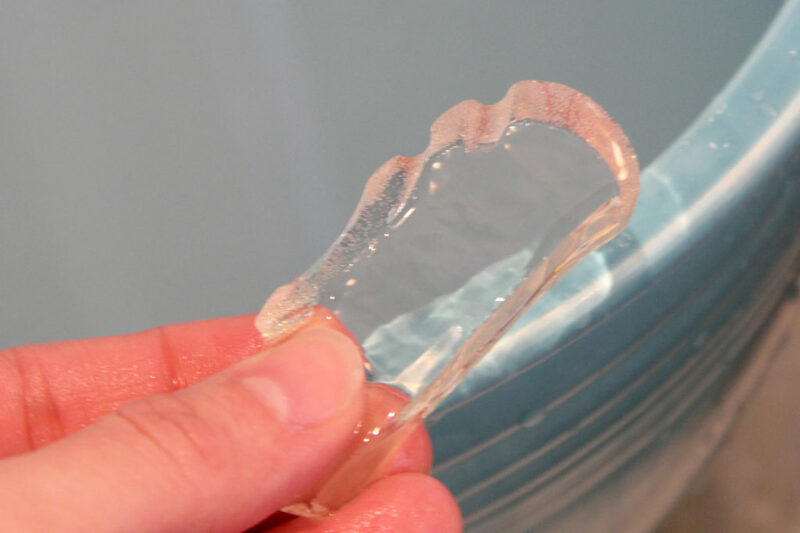 Isopropyl – Isopropyl is also commonly called rubbing alcohol. It comes in different strengths, from 50%, 70% and 90%. 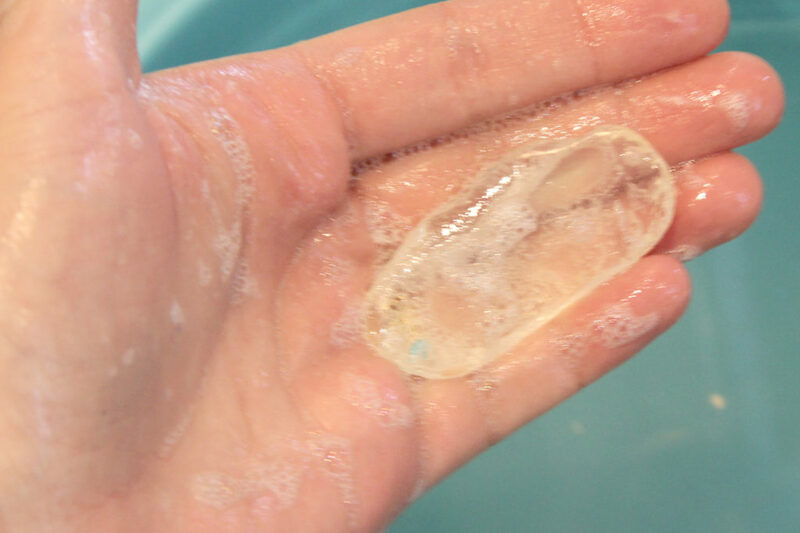 Like I said, isopropyl doesn’t seem to be the best in transparent soap but it is cheaper than ethyl and does work. Use the highest strength that you can find. 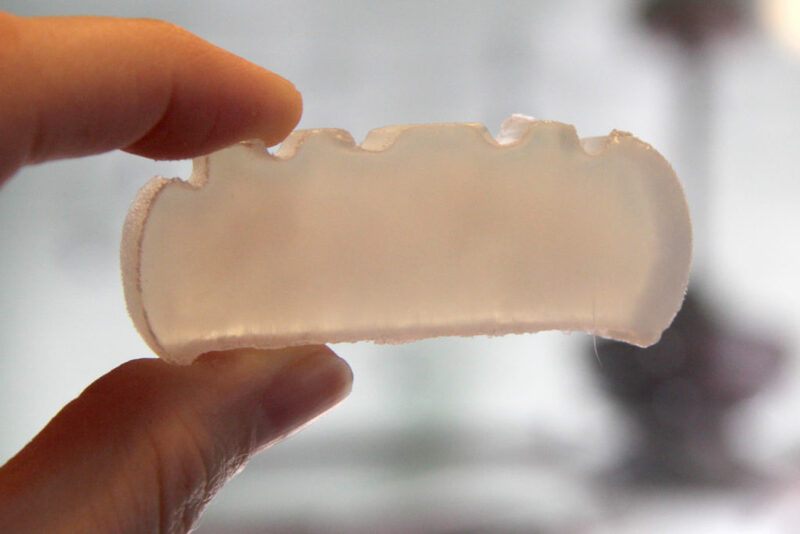 Ethyl (Ethanol) – This type is best for transparent soap, but it is also more expensive. Denatured alcohol is a type of alcohol that you can find at the hardware store. It has a poison added so that people don’t drink it. 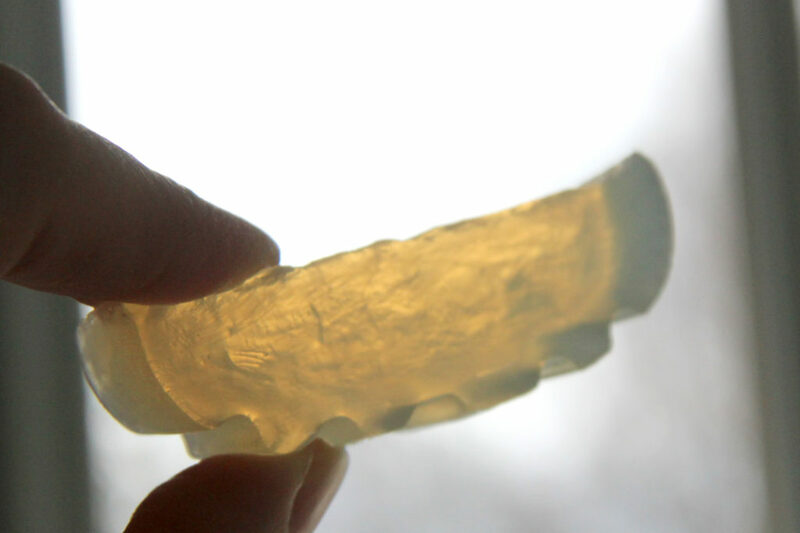 You can use denatured alcohol in transparent soap. Everclear (from the liquor store) is another type of ethyl alcohol. Look for 190 proof (95% alcohol) for best results. 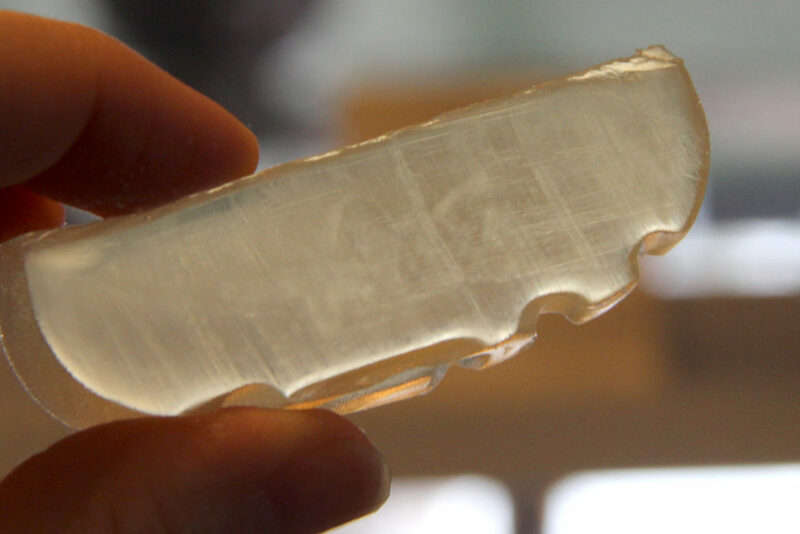 Liquid Glycerin (not glycerin soap!) 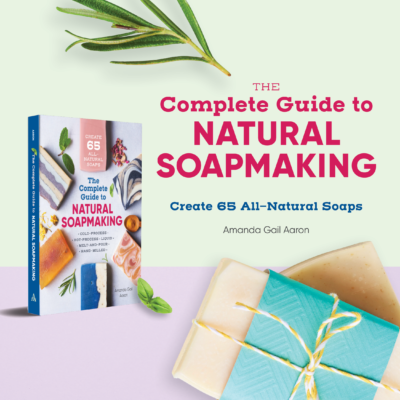 – This is a great solvent to use in transparent soap. Glycerin is a humectant and moisturizer for the skin. And like I mentioned above, since we use a 0% superfat, glycerin acts as a superfat. 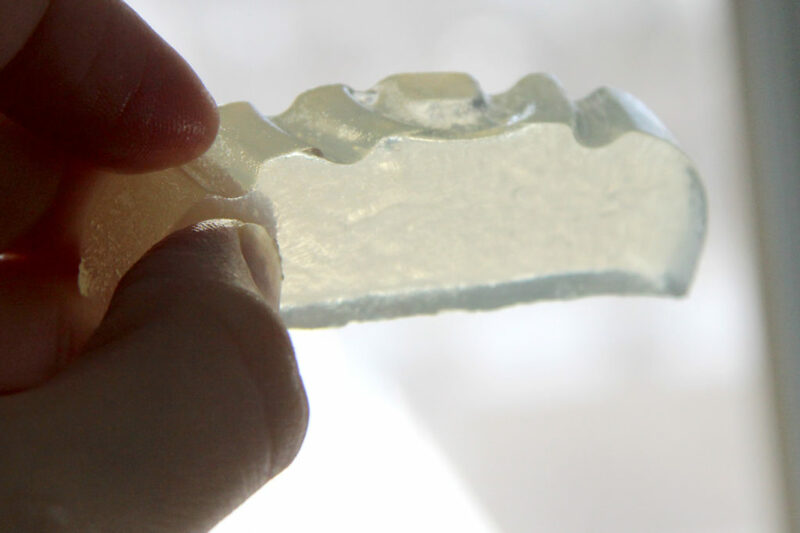 Sugar – Sugar is a simple solvent that you can try in your transparent soap. 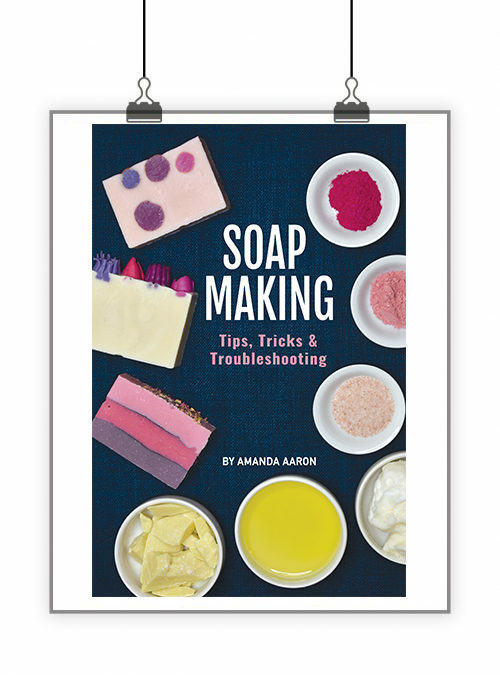 You’ll need to make a solution before you add it to your soap. Each solution in each recipe makes more sugar solution than needed, so you’ll have a bit left over. 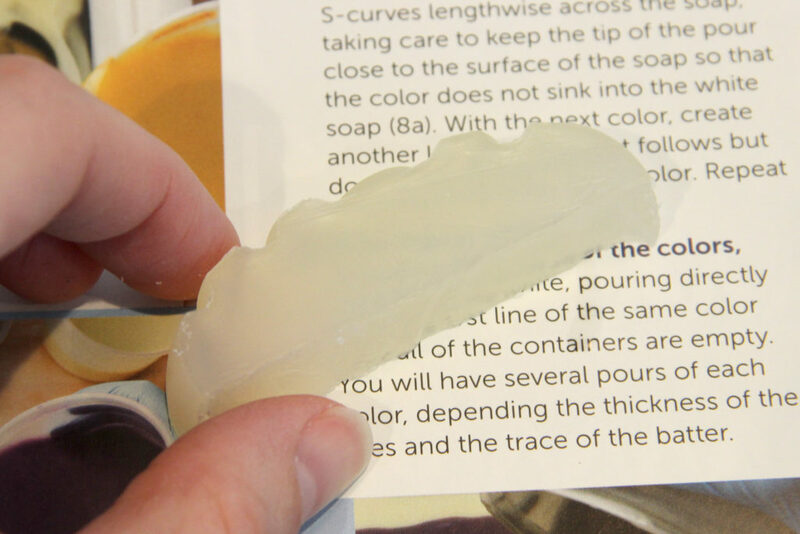 Make sure the sugar is completely dissolved before adding the solution to your soap. White cane sugar and beet sugar work best. I tried raw sugar and brown sugar but it tinted the soap a bit. You can also try xylitol. I make a sugar solution using 1 part water to 2 parts sugar. You’ll need to heat it to a boil to make sure all of the sugar melts. As soon as it boils, stop heating or you might burn your sugar. Because this soap contains a high amount of sugar and glycerin, it is best if stored wrapped in plastic wrap or shrink wrap. If you don’t, your soap can sweat and even grow crystals. 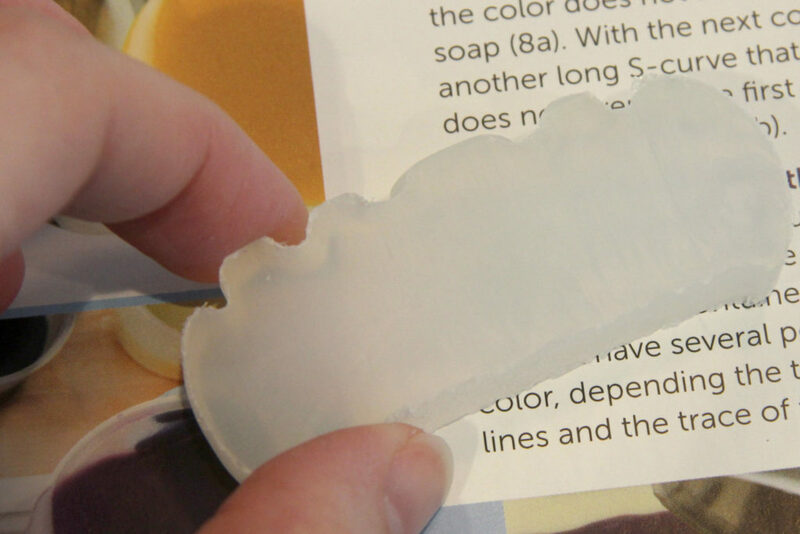 Glycerin likes to draw moisture from the air into the soap and can create a sweaty mess. Step 1: Create a sugar solution. Combine water and sugar and heat just until it boils. Remove from heat and see if it is clear. It usually is clear as soon as it boils. If it isn’t clear, boil a few seconds longer. Do not let it boil for long or it will burn and discolor your soap. Set aside. Step 2: Measure all base oils (including stearic acid) into a container and melt. I figured heat would help things along so I heated to around 180-200 degrees Fahrenheit. Step 3: I weighed the glycerin and alcohol into a cup and set aside. Step 4: Once my oils were melted I created the lye solution. I wanted it to be nice and hot. To make a lye solution weigh the water and sodium hydroxide into two separate containers. Pour the lye into the water and stir. Safety! Be sure to wear goggles and gloves and mix your lye solution in a well-ventilated area. If you need help making a lye solution, check out this video on YouTube. As soon as the solution cleared up a bit, I poured it into the melted oils. Step 5: I used a stick blender to mix. If your formula contains stearic acid, it will get quite thick. Step 6: Pour in the glycerin/alcohol mixture and blend using a stick blender. 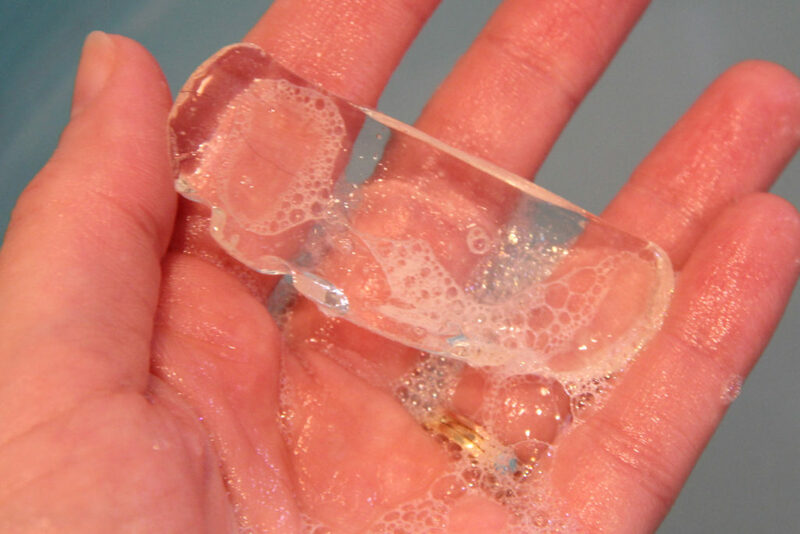 Your soap will turn liquidy and soon clear. NOTE: If you’re making a batch of high-solvent content, add half, blend until clear and then add the rest. (Do this for batch 5 & 6.) If you add all the solvents up front, it takes awhile to come together. Step 7: Mix for about 2-4 minutes. Stop mixing and see if a skin forms. If a skin forms, pour in your sugar solution. Step 8: Mix a bit more. I mixed only about 20 seconds more. Step 9: Pour into your mold and put into the freezer until firm. 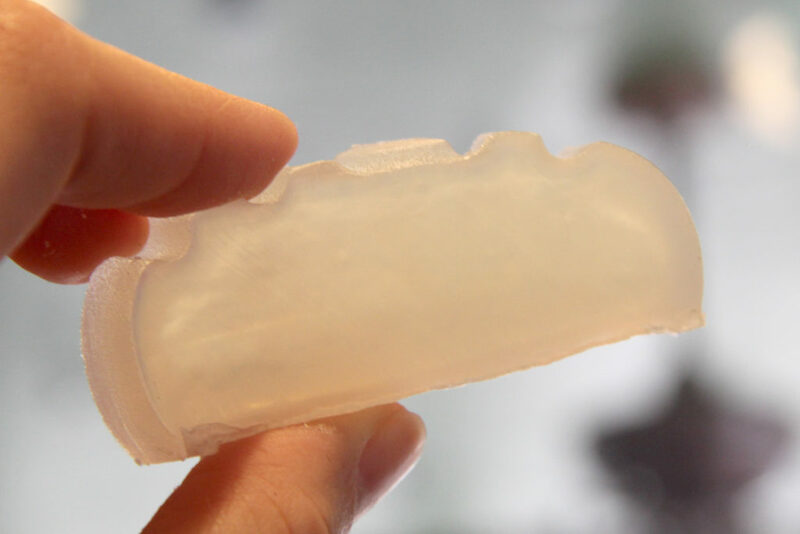 As soon as the soap is firm, you can unmold it. Step 10: Wrap it up! Here are some of my test batches that I made and results. This is where I started. I didn’t have a good alcohol, only 70% isopropyl so didn’t expect super clear soap. I wanted to try it without a sugar solution. Results: Decent lather, though not very clear. More white than yellow. This is the same as batch #1, but I did add sugar solution. I used raw sugar, which definitely tints it more yellow compared to regular white sugar. Results: Yellow tinted because of raw sugar. Not very clear. More dense lather. For batch #3 I walked up to the liquor store and bought some Everclear. I bumped up the glycerin and the sugar solution. I started using white sugar at this point. Batch #4 I went in a totally different direction with different oils, more closely mimicking Harriet’s recipe that she shared. I did use more sugar solution. Results: This is a more yellow-tinted soap because of the rice bran oil. Nice lather. This one felt the best once rinsed-off. No tight feeling on skin. I have to say that this is my favorite…even if it isn’t crystal clear. I might try this one again and bump up the solvents. 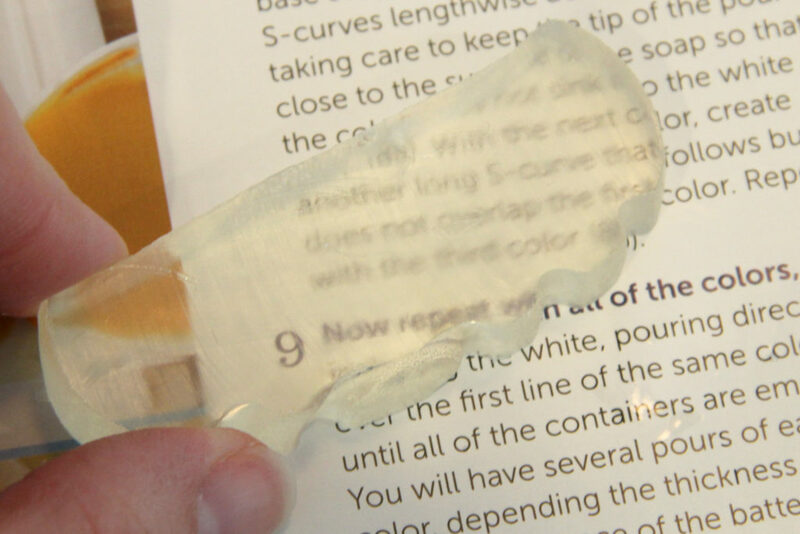 At this point, I’m not really getting the crystal clear results that I’m looking for. So, let’s bump up the solvents! For batch #5 I bumped up the solvents quite a bit! I also reversed my stearic and coconut amounts, using more coconut than stearic. Let’s see what happens. 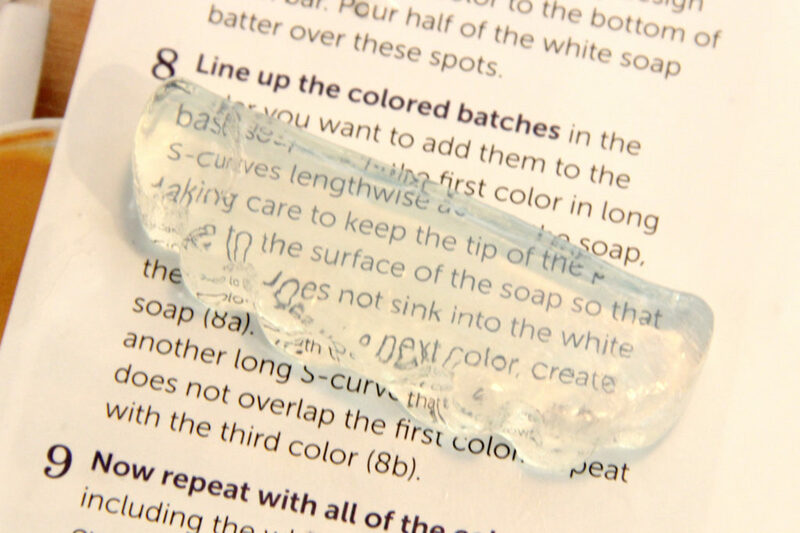 Results: The most crystal clear soap. Must wrap right after unmolding because of the high amount of solvents. Not the best lather when unmolded but it will probably improve a bit. .
For batch #6 I wanted to leave out the sugar solution and just use alcohol and glycerin. I bumped up the alcohol a bit. Results: Not as clear as batch #5 with sugar solution. The sugar certainly does help with clarity. Not bad, though. Low lather. There are my results and recipes that I’ve tried so far. As the soap cures a bit, the lather and clarity can improve. 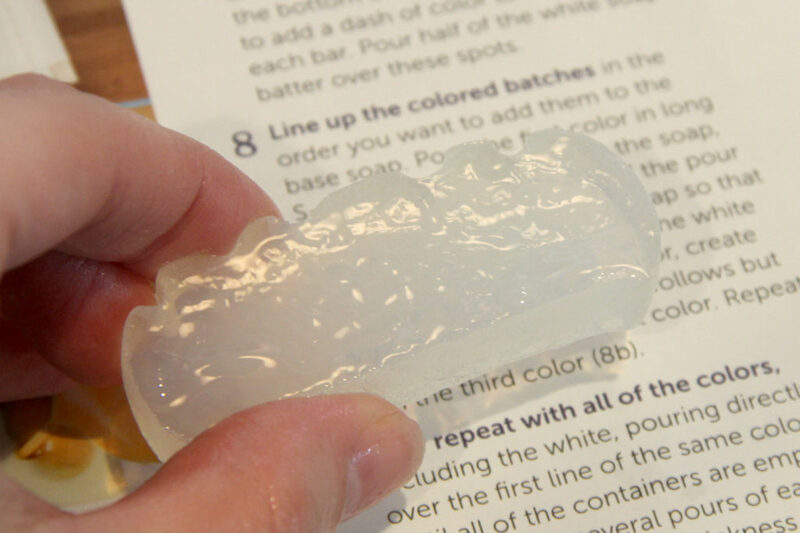 So, test your soap right after you make it and test it again in a few weeks. 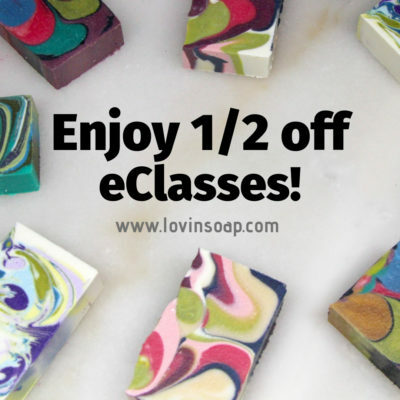 Be sure to wrap your soap up or it will sweat…especially batches 5 and 6, that use a higher amount of solvents. Moving forward! At this point, you can keep pushing the solvents to get clearer and clearer results. You can experiment with different oils. There is a give and take. The more solvents you use, the more clear the soap, but the more issues you might have with sweating, crystals growing and lather. Don’t be afraid to experiment as I did! 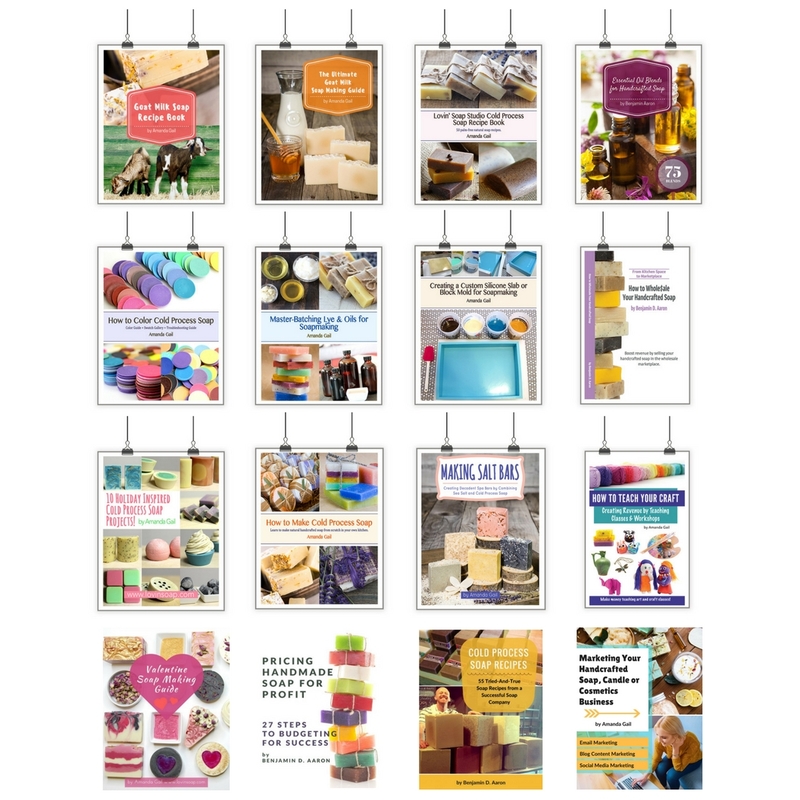 This process is super quick, so you can knock out several small batches in one day. 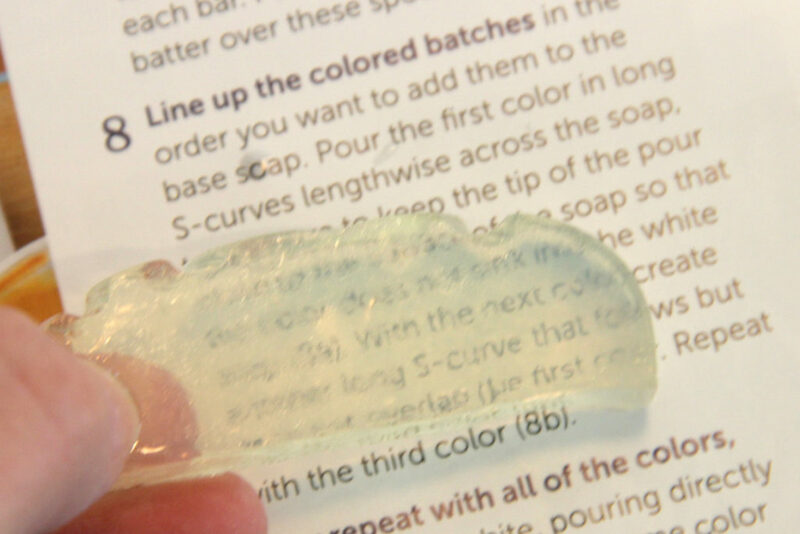 Good luck and happy quick transparent soapmaking! To celebrate Spring finally arriving, we are having an eClass sale! All eClasses are 50% off, now through April 4. eClasses can be taken at any time from the comfort of your own computer. You can watch them over and over again…your class will not expire! Hi Amanda, I have a question: when you write “Sugar Solution – 100 grams (solution was 100 grams sugar + 50 grams water)” what do you mean? Do you add 100 grams of sugar solution (made with 100 grams sugar + 50 grams water, so you discard 50 grams of this solution) or you add 150 grams of sugar solution (that is 100 of sugar + 50 grams of water)? Hi Roberta! Make a solution using 100 grams of sugar and 50 grams of water. 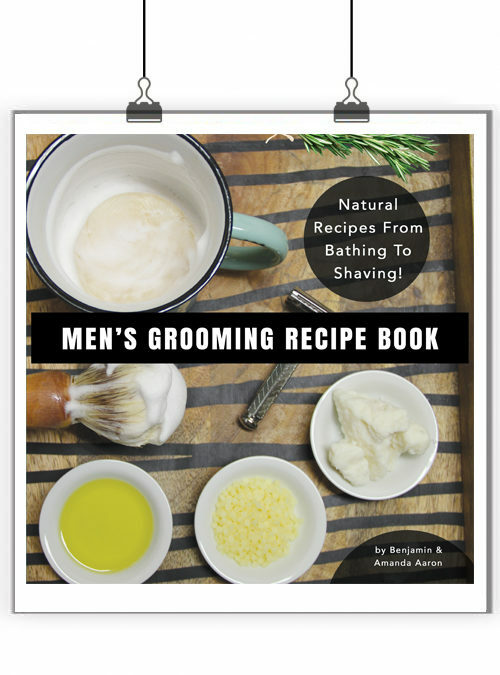 When adding it to your soap, only add 100 grams. I always make extra in case water evaporates. I’d rather have more than not enough. Good luck! Hi Amanda, may l ask, what is “ever clear”? You could try it! It might not be as clear. Everclear, vodka, are essentially ethanol and water. 100 proof = 50% ethanol, 150 = 75% ethanol, 190 proof = 95% ethanol. So if you would use 10g of Everclear 190 proof, that’s 9.5g of ethanol. To get that much ethanol with Everclear 150 proof, you would need 12.7g. Super interesting, thank you for posting. And thank for directing up to Harriet Pretzsch’s site – very cool! I have a question about the superfat issue. 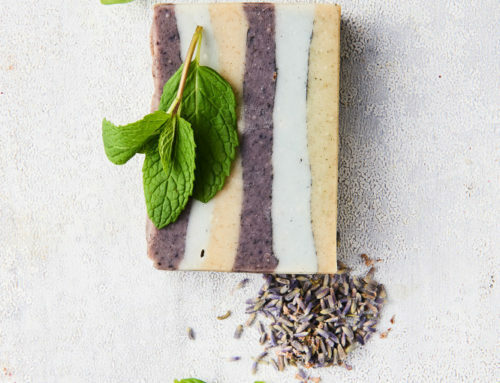 I’ve tried using the detergent free version of M&P soap, and it is still really drying to the skin, so I’ve been planning to make something like this for a while. I’m not that concerned about it being very clear, so I assume that means using more glycerine to get a more moisturizing soap. I’ll experiment. But do you have any idea about the finished level of superfat we’re talking about here? Also, I’d rather not use the freezer > what effect do you think putting it in the freezer adds? 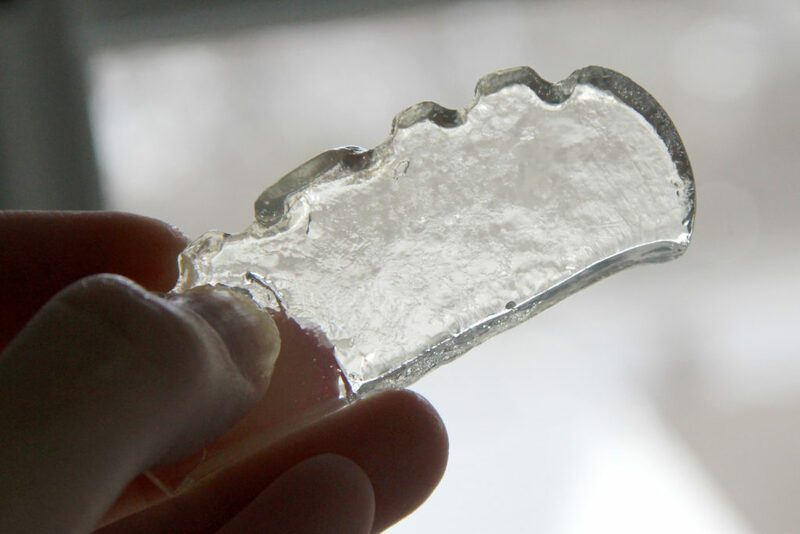 I want to try it with myristic acid instead of stearic. What do you think? What is the everclear solvent? ethanol? You could give it a try! Everclear is an alcohol that you drink. It is 95% ethanol. Sorry to be fussy but don’t drink Everclear straight! People mix it with syrups or fruit juices to mak liqueurs or flavored vodka. The reason it’s more expensive than denatured alcohol (and the reason you buy it in the liquor store) is that liquor taxes are imposed… since you can’t drink denatured to get buzzed, no liquor tax. Thanks for sharing Amanda. You are the best!